Three-year old Pixate joins Google to help develop new design and prototyping tools as result of a deal with financial terms that remain secret, as usual. As Microsoft continues to acquire various small companies with projects and development teams that can prove useful to help the software giant to achieve various long-term goals, Google appears to do the same. Their last purchase is Pixate, the company behind Pixate Studio - a software that allows designers and developers to test mobile interfaces, as it generates native iOS and Android prototypes. 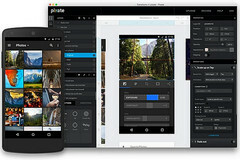 According to the official blog post by Google's new acquisition, "Pixate was started three years ago with the goal to make designing and prototyping native mobile applications easy and more accessible. Our early adopters helped guide us along the path of making tools and services that best fit the needs of designers struggling to turn their ideas into reality." Even in this short period, the company's flagship product became a tool used by both single freelancers and global corporations. The good news for Pixate Studio users is the price cut to zero of the software, which now becomes free. The Pixate cloud service also gets a cost cut, although it does not become free. This service now costs $5 USD a month or $50 USD a year, per user. Existing Pixate Studio users get $150 USD credit to use with the cloud service. Pixate employees are joining Google's design team, but no other details concerning the terms of the deal have been unveiled for now. Remains to see what future holds for both Pixate and Google.